SEAT is continuing its extensive programme of product improvement with the launch of two impressive new engines in its best-selling models. The key addition comes in the Ibiza range with all three bodystyles - SC, 5dr and ST - now available with an efficient 105bhp 1.2 TSI unit, mated either to a five-speed manual gearbox or a seven-speed DSG. The turbocharged petrol engine replaces SEAT's 1.6-litre 105bhp unit. Despite being considerably smaller in terms of capacity than the 1.6 it replaces, this new TSI generates an identical 105bhp. However, performance and acceleration figures both improve versus the 1.6-litre - in the case of 0-62 mph acceleration the time drops by more than half a second to 9.8 seconds while the top speed is marginally better, too. The new turbocharged unit also makes the Ibiza both more efficient. Compared to the 1.6-litre, claimed combined economy improves by 25%, from 44.8mpg to 55.4mpg (SC and 5dr) while CO2 emissions are slashed by 20% from 149g/km to just 119g/km. Manual versions are also badged Ecomotive as they feature SEAT's new Stop/Start and Brake Energy Recovery technologies. 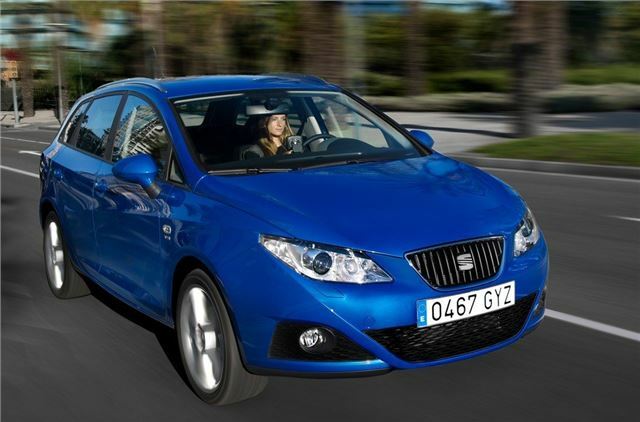 Prices start at £12,780 RRP for the Ibiza SC 1.2 TSI SE. Meanwhile the Leon and Altea families now feature a 140bhp 2.0 TDI with common rail fuelling in place of the previous unit's pump injector system. This, too, is offered with a manual gearbox or DSG. Like the TSI the 2.0 TDI CR is offered with a manual or DSG. In the Leon, the new common rail turbodiesel sees CO2 drop from 147g/km to just 125g/km, while combined economy climbs from 50.4mpg to 58.9mpg. Similarly impressive improvements result from the new common rail engine's introduction in the Altea and Altea XL. CO2 in both bodystyles drops to just 129g/km, while combined fuel economy climbs to 57.6mpg. Performance is still impressive though. The Altea 2.0 TDI CR, for instance, races from rest to 62 mph in a spirited 9.7 seconds meaning that the new version is, in fact, quicker off the mark than the previous pump injector version. Prices for the Leon 2.0 TDI CR in SE spec start at £18,570, while a similarly engined Altea SE is available from £18,770.